Today is our son Josh’s birthday. The heartache of the past year cannot surpass the joy 28 years ago on this day when we first became parents! We love you Josh and believe your best days can be ahead of you. We continue to pray for you every day. What great parents you are!! God loves us so very much. He will never leave us nor forsake us!! I believe Josh's greatest days are ahead too. A tired but hopeful father was taking his son to a rehab/juvenile detention facility once more. When out comes his meddling neighbor:"again! ?" The neighbor said. "You're taking this good for nothing boy to rehab/juvenile detention...again!!?? ""if he was my son you know what I would do? " continues the neighbor. "I would just lock him up forever and throw away the key!" The dad just looked up at him with a weary face and calmly answered:"If he was your son I would do the same thing, but he's not your son he's mine." We are always so quick to judge when they are not ours . But when they are ours that's when it really hurts and we never give up on them no matter what. God never gives up on us. Love this! It is so true. Too bad people are quick to judge before they are to love. We love and protect our children no matter what just like Jesus did for us.HAPPY BIRTHDAY JOSH, you are loved.Look to the future, it will be better.GODBLESS the Dugger family. It would be better if people treated every child like it was their own. Too many parents only care about their own kids. It's made tons of self-centered, greedy adults. Happy birthday Josh ! Hope you have many more. That´s a beautiful birthday wish. My daughter is soon-to-be 2 years old this month. I only hope that if she makes decisions when she is older that are against everything she knows is right that my husband and I can handle it with as much grace as our Heaveny Father has given us and that Jim Bob and Michelle are giving Josh. They are precious people. God bless them all. I pray that Josh has a true heart of repentance and that his life can be renewed along with his sweet family's. Boy, they are not over it. That message speaks volumes about how tense the situation must still be with their son. Is anna really pregnant again?? Please answer this one! Anna has not made a pregnancy announcement since announcing that she was expecting Meredith. Every parents love should be this strong...tears. I'd be really depressed if my parents thought it was OK to post online, on my birthday, about the heartache I caused them, and how they had to pray for me. Overall, that is not a very uplifting message for any son. I wonder why they felt the need to post that online. Surely there are other ways to communicate with their son than through social media. Are they trying to remain in the public eye? Folks, no one can ignore the "elephant in the room". Even Josh is aware of it. They are simply reminding him, that in spite of the "good, bad, and the ugly", they LOVE him and will see him THROUGH it. I think their wishes were well said, and well meant. In light of their familyIN THE PUBLIC it is only fitting that they should proclaim their love for them IN PUBLIC!!!!! Kinda like his brother saying on one of those specials recently that he no longer wants to be like his brother. It's one thing to feel that way but entirely another to say it on TV for the world to hear. I so wish they had people advising them on how their very public comments about their son/brother should be kept in their home and go no further. How can Josh heal with even his family keeping his failures in the spotlight? Fans of the Duggars would know that Josh's birthday was approaching and would be waiting for some word from his parents (since they post well wishes for all of their children). To let the day go by with not a word from them would have raised more questions and speculation. I think the message was perfectly written and we should all be so blessed as to have parents that pray for us every day! Parents: Pray for your children! I wish I had the kind of parents that had that kind of love and dedication for me to get down on there knees and pray for me! To put me in God's hands....help me crawl up into his lap....feel his arms wrap around me and calm me, give me peace....take my hand & gently lead me..
Then looking side to side....I see to my left and to my right..sitting next to me on his lap.... The parents that gave me the same Love,peace,warmth,security & forgiveness to gently led me. Even when I pulled away and went on a wrong path they did not throw me away like trash..but did the best thing a parent can do pray!! It seems that as Christians we are held up to a higher standard. Which is fine!! BUT some expect us to be perfect!! We can't!! There is only one who is perfect!! We can strive to be the best believer we can be but we cannot be perfect!! To be perfect would mean to be him!! There is only one Heavenly father!! So to you Josh..A BIG BELATED HAPPY BIRTHDAY ��!! I hope that the next one who wants to say negative things..will look inward first....To be able to throw the first stone into there glass house!! God Bless You!! God Bless You!! You did what you thought was right. You placed things in God's hands & left it..Someone else brought it out to play!! Each of you have to answer to God for the actions you took..I believe your's were of love & protection of ALL..The other I'm not sure of....BUT DO NOT think it was the same. I do not believe that there is a parent out there that can look there baby in there beautiful innocent face & love them dearly and eternally @ 3 days old & STOP loving them @ 30 because they made a mistake!! A bad choice. I love you..I love the family.. The show.. I will pray for you continually. I'm so very impressed that you have gone on & acknowledged that yes....Josh has made mistakes and put your family thru some really bad severe pain, he is still your son. We here on earth have not gone through anything like Jesus did! Woman �� Mother, Sister,Niece or Grandma..But I'm better than I use to be!! PRAISE GOD!! Heartache in the last year only? Are they not acknowledging that Josh had problems long before that? Or are they only counting from the time that the truth became public? Either way, it's not the best birthday message they've ever posted about a child. If they really do mean in the last year, then it sounds as if they are only upset about the infidelity, and nothing else that happened before that. That sounds odd. The last year is when everything was exposed, though, even the older stuff. They could have said "any heartache cannot surpass" etc., and acknowledge what their daughters went through years ago, too. The way they said it diminishes that pain. Because everything that happened We years ago was over done forgiven and forgotten. Why do the Duggars feel they have to publish every little milestone in their lives? So, he is 28. Lots of young people in the world are 28. The world already knows that they love their son like millions of other parents love theirs. Sorry you read the message. Some wish for updates. If one doesn't wish for updates, don't read them or go to sites about them. Strange when one does pursue info then reacts in such a way. They post birthday wishes to all there children or is it just because it's josh?? When they are so much in the publics eye they are somewhat expected to post everything going on in there lives. Josh is still there son they do not love him any less they may sandfly just have much more heart ache..
Goodness it's a double edged sword if they post a birthday wish to josh. They will be condemned if they do and condemned if they don't!!! In my opinion, I think this message shows the duggar parents are not turning thier back on thier child!!! If my son did the horrible things josh did, I would never stop loving or praying for him. Sure I would have handled the situation differently but once you become a parent you never stop loving your child no matter what!!!! I agree!! No parent EVER STOPS LOVING THEIR CHILD!! We are not PERFECT!! NONE OF US!!!! Has your "God" served you WELL?? The Duggars would not be condemned if they refrained from posting about such family milestones. Far from it. No one would notice. And their children and grandchildren could enjoy a life away from the spot light, a normal and more healthy life. Instead they are constantly putting themselves out there. Could it be that they have a TV show to promote? No one but Josh and Anna needs to know how hurt his parents feel or how much they care about him. That old photo does remind you Josh was just a kid once. His choices got him where he is today. But people can change IF they really want to. Everybody is somebody's child. Happy Birthday Josh, Christ is your guide and the way he leads you is on a narrow, steep road that has the fruits of repentance along the way, may you continue on your journey in your 28th year of this life and remember there is a reward in living the born again life of a prodigal come back. You are a great inspiration and when I cheer for you I cheer for all who have a sinners redemption, including myself. Another year opens the possibility for change, inner growth, deeper conviction to prayer and commitment to trust, truth and humility. May Josh find and nurture these blessings. JOSH , MAY OUR LORD BLESS YOU , AND HELP YOU . MAY YOU BE PROTECTED AND BLESSED! 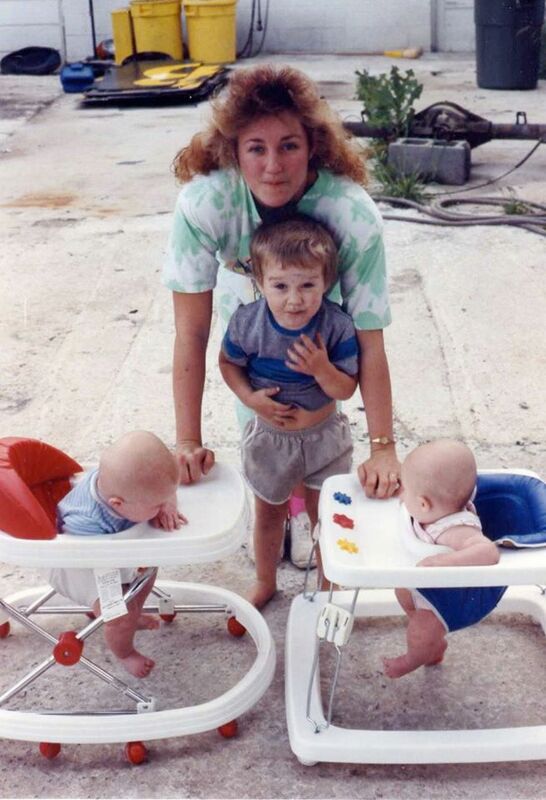 Look at Jana and John david...awww. I think so too Josh. God will restore the years the locust has eaten away. Happy Birthday Josh. God bless and keep you strong as you go through this hard time. Move on and be strong for your family. They all need love and their father. Have a great day and God Bless. I think all believers are praying for him and hope to see everyone reunited soon and forgiveness to be foremost in action on the part of all. Happy Birthday! Happy Birthday Josh! May God Bless you have a wonderful day. A very happy birthday to Josh. Wishing him all the best. Despite the media circus of last year, l just have faith that he will and the family will heal and be stronger. Such a great reminder that he's still so loved regardless of being human! Happy birthday Josh. Many of us wonder how you are doing and are praying for you. No matter where we are in our walk with God He will meet us there. May your heart be changing in the light of God's Word that is able to transform us(Heb 4:12). Great truths in I Peter 2:9. His blessings on your life. Hi Ellie! It sounds like you've been real busy lately with getting your new dryer and also getting your dishwasher fixed! I'm sure you are a busy homemaker! Thank you for all you do for the 3 blogs you and your mom run, that is for sure lots of work! And then to try to run a family household and cook and clean too, my goodness!! I wanted to thank you both for everything with the blogs! Really@anonymous Mar. 4 2:34 pm--- do you have a clue at what millions of other people do in a day???? Running a few blogs and being inconvenienced by a couple of broken appliances is not so bad!!! I'm sure Ellie would share that sentiment! She is blessed to be producing blogs to earn income; many women work back breaking jobs to provide for their families; sometimes while even studying for a college degree! I don't think you needed to attack the blogger. She didn't say other women weren't busy--or busier--she was just saying thank you. I hope you have someone in your life to say thank-you to you. Sounds like you could use it! She didn't discredit the effort other women put into raising their families. She just acknowledged that Ellie is juggling a lot, and she appreciates her continued devotion to updating her blogs on top of her other priorities. Happy birthday to josh and strength and love to his family. There is nothing wrong in celebrating this milestone and they shouldn't have to explain themselves. I hope Michelle and JimBob take a good, hard look at this photo. It models a mainstream family happy with their children on a warm day! Josh even gets to wear shorts!!! Please remember; Josh has yet to say he still loves Anna. Maybe, he does not want to be married to Anna any longer. I've been saying that from the beginning. If he was happy he wouldn't have cheated. The situation makes that "I will be there for you" song he sang to her at the wedding not seem genuine at all. I can't imagine standing up in church and vowing those things, singing those things, and then doing the complete opposite. He has a tremendous amount of healing to do, with himself and with his family. He more than likely was already committing those acts while courting and then publicly marrying Anna. Those 2 accounts were registered to their first home--total newly weds. Maybe he wanted to get caught. Maybe he felt that was the only way to his freedom knowing the "heartache" it would cause in his inner circle. People do very strange things when they feel trapped. There are some people who will cheat on their spouses, no matter what. It does not matter what the spouse does. To say that Josh cheated because he was unhappy in his marriage is not being fair to Anna. Josh may have still cheated if he had been married to someone else? But this id between Josh and Anns and no one else, including his parents and certainly not the general public. I would not want yet once again a public reminder of the heartache I have caused to be the beginning of a "happy birthday" note. How sad. It's doubly sad if you've read the happy past birthday wishes they've posted for all the other children. This statement is such a downer. Wonder how Josh felt, if he read it? Wishing you many more birthdays to come in the future. God gives us all grace and mercy. Choices I made as a younger person were rather horrendous. Much in part due to the sexual abuse I experiences as a child from a family member. But God gives each of us grace and mercy. I can do no less to others. I am glad I don't have to make the decision if someone is forgiven or given grace in the eyes of God because I can't see what is in a person's heart. I can't see what is in Josh's heart. I can't see what is in the hearts of the rest of the family. Yes, by their fruits you shall know them. But when the fruits change, we must look again and trust God knows the heart. Be blessed Josh. Because I don't know your heart but God does. May you and your family continue to experience God's grace and mercy since God knows your heart. I get the feeling that Josh doesn't want to come out of rehab and face his same old world again. I bet he'd be happier by himself somewhere, without the pressures of wife and kids and family and the way he was raised. He sure made a concerted attempt to break from that! He seemed weary ever since they moved to DC. You could tell he wasn't happy, every time he was speaking with his work duties or on the show. But little did we know the reason why, and what he was doing privately. If that website had not been hacked, this would have exploded some other way. It was a ticking time bomb. He needs to start a new life but far, far away from the pressures of the past. If he has to slip right back into his old lifestyle when he gets out of rehab, he could easily fall again. It's a pattern that could repeat. I think that job he took in DC was way too much responsibility for him. From selling cars to speaking out in public against the sorts of things that organization was against? Quite a leap for someone so young & inexperienced. Must have been a tremendous amount of pressure, then to come home to 3 very young kids..... Recipe for a mental snap, which indeed happened. Wonder if anyone in the family saw it coming or tried to stop it? He was cheating BEFORE he left for d.c. and plus he was already going to many public events political gatherings talk shows etc and Anna and the kids and the show. I'd think moving to d.c. might take a load off (moving isn't easy though) because he was already involved in politics and they filmed less and he made less public appearances. I think it was perhaps a little strange that this post was made on their Facebook page. A very positive part of the protective, insular, and most clearly family focus aspects of the Duggar's values is their familial support system. I think this should have been a private message, or at the most a simple picture of the day he was born and a happy birthday message without a reference to the past year and the years between the ages of 14-16 and the difficulty it put on the family. it seem a little to Hollywood and it almost makes me think a P.R. rep wrote it with other intentions than a loving message from mom and dad. On the other hand i understand what they are saying standing by their son and trying to make him feel loved despite what he did. If it had been my behaviour that cause the kind of suffering we saw the family go through, it would be a very painful day anyway and I am not saying ignore it. I feel a private and personal message would mean so much more. In recovery their are no days off but one can be connected with their program, higher power and mentors without beating one's self up. If Josh is who they say he is it would be nice for him to experience positive healthy things on his Birthday and keep it private. It was their son's BIRTHDAY...the wanted to wish him a Happy Birthday. .same as they do each child. End of story! Happy Birthday Josh! Wishing you the best future possible! May God fill your life with love and Happiness surrounded with Anna and your children! Best of luck for your whole family! We miss you all! It's obvious that's not a birthday message aimed at Josh, who wouldn't be reading words from his parents online. That's a PR message to the media that they'd better stop saying negative things about Josh because the Duggars are standing by him, now that he's probably emerged from wherever he went for months. They used the opportunity of his birthday to get this message out there, because it sounds so caring. Just because the family is in the spot light does NOT mean that people has the right to make bad comments about the family.If you don't like the family stop following them on TV. People who does this is oobviously hooked of gossip and running there mouth's. Hang in there Duggar family GOD HAS YOUR BACK!!!!! "Whoever is without sin cast the first stone" many people have forgotten this and also no one truly knows what they would do until it happened to them. God Bless the Duggars in their healing.. this can't be easy for ANYONE.. public or not. That casting stones quote is getting old. Imagine what life would really be like if we saw all sorts of wrong things happening yet we kept quiet about them for fear of "casting stones." It would make the world worse! Speak up - be heard - make a change - make things better. Don't be scared. God gave you the mind to know the difference between right & wrong. "If you see something, say something" is a more appropriate quote these days. I love what you said!! God's Word says we are NOT to judge those outside of Christ--but we are to speak up about those who claim to Christian. The Church has done this backward. Judging the " world" while calling what Josh did " mistakes". Yes--we are to speak up! That's not casting stones --it's the only way to stop or prevent abuse. Yes this would have been private but for people wanting to destroy someone. This very encouraging example is for all of us. Happy Birthday Josh. God Bless. Josh destroyed himself. And you know that with God watching, nothing is private. God gave Josh the consequences of his actions. That's the only kind of example here.